The ways in which the emancipated slave's quest for economic autonomy and equal citizenship shaped the political agenda of Reconstruction;The remodeling of Southern society and the place of planters, merchants, and small farmers within it;The evolution of racial attitudes and patterns of race relations;Abraham Lincoln's attitude toward Reconstruction;The role of 'carpet-baggers' and 'scalawags;' andThe role of violence in the period.This 'smart book of enormous strengths' (Boston Globe) has become the classic work on the wrenching post-Civil War period, an era whose legacy reverberates in the United States to this day. Winner of the 1988 Los Angeles Times Book Prize for History. Winner of the 1989 Parkman Prize. Winner of the 1989 Bancroft Prize. Finalist for the 1989 Pulitzer Prize for History. Finalist for the 1988 National Book Award. Finalist for the 1988 National Book Critics Circle Award. 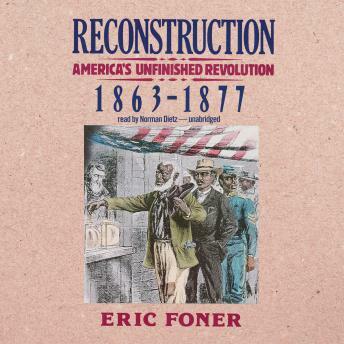 A PBS Pick of Books about Reconstruction.